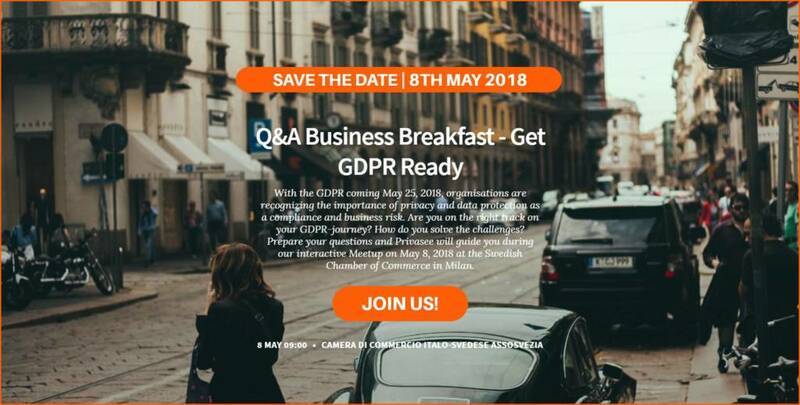 Join us on our Q&A Business Meetup – Get GDPR Ready on Tuesday May 8th, 2018, organized by Privasee in collaboration with Internago. Special guests Martin da Fonseca, COO and Information Security specialist and Jennifer Ekström, from Privasee, will answer your questions and share exclusive advises on how to make sure your company is GDPR-Ready. The Q/A Business Meetup will be held in English and Italian. Privasee will offer training sessions in Milan from June and onwards. More information about these training sessions will be available online shortly. Click here if you are interested in more information. Internago works with internationalization and in particular with incorporation and local administrative compliance. Internago is a Swedish company with global online presence and with offline presence in Sweden, France and Italy. Internago is an affiliate partner to Privasee in Italy.